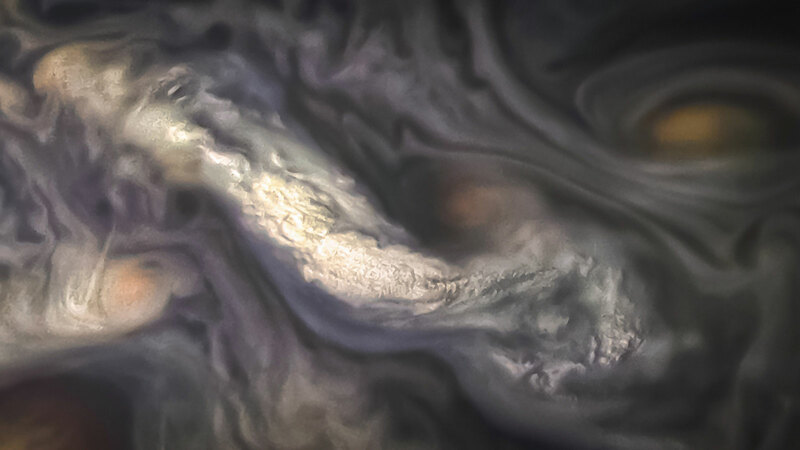 This image captures a high-altitude cloud formation surrounded by swirling patterns in the atmosphere of Jupiter’s North North Temperate Belt region. The North North Temperate Belt is one of Jupiter’s many colorful, swirling cloud bands. Scientists have wondered for decades how deep these bands extend. Gravity measurements collected by Juno during its close flybys of the planet have now provided an answer. Juno discovered that these bands of flowing atmosphere actually penetrate deep into the planet, to a depth of about 1,900 miles (3,000 kilometers). NASA’s Juno spacecraft took this color-enhanced image at 10:11 p.m. PDT on July 15, 2018 (1:11 a.m. EDT on July 16), as the spacecraft performed its 14th close flyby of Jupiter. At the time, Juno was about 3,900 miles (6,200 kilometers) from the planet’s cloud tops, above a latitude of 36 degrees. Citizen scientist Jason Major created this image using data from the spacecraft’s JunoCam imager. JunoCam’s raw images are available for the public to peruse and process into image products at https://missionjuno.swri.edu/junocam/ . More information about Juno is at https://www.nasa.gov/juno and http://missionjuno.swri.edu. Be the first to comment on "NASA’s Juno Spacecraft Views High-Altitude Jovian Clouds"